The lower American River appears to be a nice easy run, suitable for an fun trip on a kayak. Nice detailed map of the American River Parkway, with facilities located along Lower American River. Zoom in really big to see the details. Because the map has so much details, I haven't figure out how to print it out on multiple sheets of papers. The map has too large to see on a single sheet of paper. The California Delta is a huge body of water formed by the confluence of the Sacramento and San Joaquin rivers: 11,000 sq. miles total area, 70 islands, and 700 miles of waterway. I don't know about you, but I think that a body of water deserves to be explored, particularly if it has islands and marshes. Amazingly enough, outside of a few isolated references, there is a total lack of write ups about this huge area. 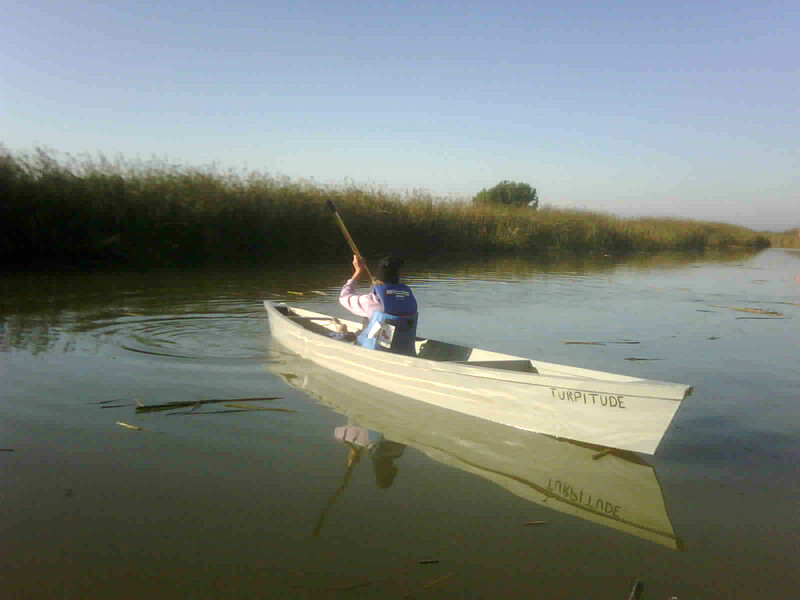 This is probably one of the best, if not the best, description of kayaking in the California Delta. Discovery Bay is a nice 1/2 day of exploration on its own, the waterways reminds me of the Foster City Lagoon. Anyway, this paddle starts from Discovery Bay and ends up at a restaurant at Orwood Resort. If you like kayaking, no doubt you either (1) have a lot of friends who go kayaking with you, or (2) are looking for people to go kayaking. Something about exploring mysterious and sometimes turbulent waters calls for kayaking buddies. You never want to find yourself flipped over in a place where your screams cannot be heard (I am over-dramatizing it a bit). If you belong to the latter group, you might find the following information useful. I am going to link to a number of kayaking groups/clubs that you can join and go kayaking with other people. My favorite, this group has a nice mixture of kayakers who own their own kayak and those who don't. Paddles are held in locations all over the greater San Francisco Bay Area. Many outings are done at locations where one can rent a kayak. Some events are held where there are no rentals. It started only a few months ago but has grown to become one of the most active. This is a "real" club in the sense that they charge a due and have meetings. This is another "real" club in the Bay Area. If you know or other kayaking organizations in the San Francisco Bay Area, please let me know and I will add to this list. The only on-water photo I can find anywhere for Alviso Slough. Hopefully, after the grand opening, there will be many more. It's finally here. After multiple delays, the new Alviso Marina Boat Ramp is going to officially open on June 5th, 2010, and a big party it is going to be. Organizers have estimates that there will be up to 1000 people and 100 kayakers. (1) Water depth at low tide - I've heard the minimum is 1-1/2 feet to 3 feet at low tide. Will that be enough for kayaks, particularly those with a rudder or fin? (2) Sharing the waterway with motor boats - is it wide enough at low tide? The estimates were correct. It was a big party with about several hundred people present. There was a live band, lots of booth and free cheese burritos. Several TV stations were doing live news coverage there. The ramp was as good as boat ramps get. Thoroughly modern with two large floating docks. Everyone who I talked to were ecstatic that a ramp like this is finally put in at Alviso Marina. One older couple told me that they used to fish two feet long sharks and sturgeons in the bay a long time ago when the old docks were operational. Water depth at low tide - no problem for kayak, or motor boats for that matter. I saw several motor boats launching an hour or two past low tide with no problems. They say a picture is worth a thousand words. Here are some to prove it. A new set of boat ramps have been installed at the Alviso Marina which will enable kayaks and small boats to enter San Francisco Bay from San Jose for the first time in 20 years. With this convenient access point, I believer there will be many kayakers interested in paddling in Alviso Slough. However, since there hasn't been a public access point in 20 year, not much has been written about it. The slough is both wide and deep, making any kayak trips a breeze. Speaking of breeze, in spring and summer afternoons, it gets quite windy here due to the thermal drafts coming from the bay. Hot air in the central valley rises, causing cool air from the coast to be sucked in. Since most of the coast is separated by mountains, with the only opening at the Golden Gate, wind blows north to south starting at about 2 PM. However, the wind at the boat ramp is not so bad, perhaps because the Alviso Slough is protected by tall levees. The wind is particularly diminished at low tide where the kayak is riding several feet lower still. The further out you go, the more you will feel the head wind. Here is the official web site of the Alviso Marina. Ignore the picture of the marina. That was taken 20 years ago. This map is not accurate enough for navigation use and is not intended for navigation. Here are some additional useful links that describe the Alviso Slough Trail, which is adjacent to Alviso Slough. Downstream from Yosemite Valley, the Merced River is a tough Class 3/4. However, inside Yosemite Valley, the Merced River is very peaceful. Here is a short but nice video showing the peaceful water and Yosemite Falls (I believe) in the background. Rafting Merced River in Yosemite Valle - Yosemite Falls in the background. The flow of the river is too slow to be exciting for adults, but it can be a really great paddle to do with young kids. A good water fight will make it fun for everyone. Make sure to bring water cannons. Kayaking the Merced River in Yosemite Valley has to be one of the tops in terms of beauty in surroundings. To say Yosemite is beautiful is probably an understatement. Out-of-this-worldly Valley of the Gods is more like it. Add to it kayaking down the beautiful river running through the middle. Words probably can't describe it. Here you have it, all the information you need to kayak the Meced River in Yosemite Valley. If you go, let me know how it is because one of these days, I will make it out there, too.